" garbage disposal companies offer delivery and pickup of the garbage bins to and from your location. " 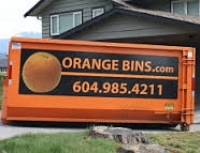 "Call to rent a 5 yard bin or up to a 20 yard bin and get sameday service in Vancouver"
"Orange Bins are delivered the same day you call so there is no waiting"
New rules go into effect Jan. 1, Metro Vancouver adds organic waste and food scraps are banned from waste stream. "Grant was just awesome! He was personable and made it very easy to do business with. He had a bin to our house within a few hours - exceeded our expectations! We also had to contact Grant a few times and every contact he was friendly and provided the information that we needed. He's quite funny as well. 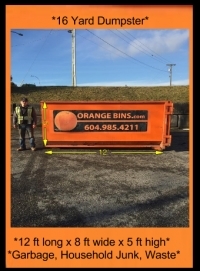 I would highly recommend Orange Bins and will do business with them again! Thanks for the great customer service!!"